If you're not at the latest version below, please see this page for how to update. fman failed to run some .bat files that lie on drives (eg. Z:/) mapped to UNC paths such as //192.168.1.7. This is now fixed. 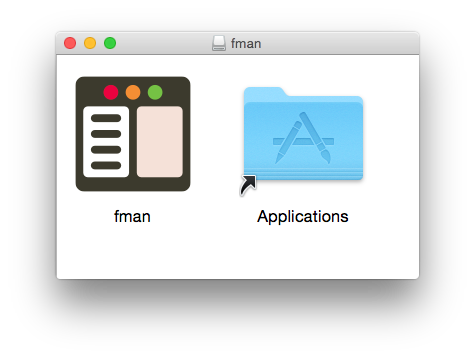 When you press Enter on Mac, fman by default only opens the file under the cursor. To open multiple (selected) files, you can press Cmd+Enter. This however opened the files sequentially. So for instance, when opening a few .jpg files, an individual Preview window would open for each one. When you now press Cmd+Enter, fman opens all files "at once". This is also useful for instance for queueing .mp3 files for VLC. fman now gives more (better) suggestions when you invoke GoTo for the first time. In particular, it suggests folders in your file system root (C:\ on Windows and / on Linux / Mac). This aims to improve the workflow for users who started typing Users on Mac and expected /Users to appear. On Windows, when you opened a shortcut (i.e. a .lnk file) pointing to a directory in fman, it was opened in Explorer instead of in fman. This is now fixed. fman sometimes prevented external (USB) drives from being ejected on Windows. This is now fixed. 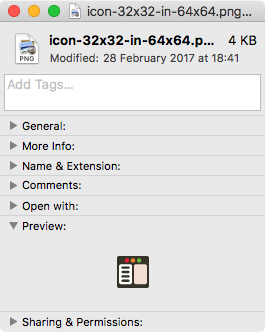 When you drag a file, the operating system displays either a "+" to indicate that it will be copied, or a different symbol to indicate that it will be moved. Which of the two operations is performed depends on the keys you press (if any). On Windows, the default operation is to move (unless the destination is on a different volume), and copy if you press Control. fman previously had this wrong (it copied by default and moved when you pressed Shift). This is now fixed. This is now fixed: fman creates the destination directory if it doesn't exist. Some users complained that GoTo was slow, especially when network folders were in the history of visited paths. The reason for this was that GoTo used to check all suggested directories for existence before bringing up the dialog. If the list of suggestions contained a network share, this check took a long time and thus also the dialog took long to respond. Now, fman continuously removes directories that are no longer available from GoTo's suggestions in the background. This makes GoTo much faster. Fixed a small problem with fman's auto-update mechanism on Arch and Fedora Linux. This message used to be shown until some command showed another message. A user rightly pointed out that this is unnecessary clutter. So fman was now changed to hide the message after a few seconds. Improved support for Cryptomator drives containing folders with special (Danish) characters. One of fman's most-requested features is visual feedback when copying/cutting files. Ideally, fman would make cut files a little transparent, and briefly give copied files a different style. Unfortunately, fman's rendering engine does not yet allow changing the style of individual files. In the future, it would be very cool to implement this. It wouldn't just enable this feature, but also (say) allow a Git plugin to highlight new/modified/deleted files. Added a new command Invert selection. To implement the above command, the new API functions DirectoryPane.select(...) and DirectoryPane.deselect(...) were added. They let you batch (de-)select files. The DeletePermanently command was unable to delete symbolic links to existing directories. This is now fixed. Added the new API function normalize(...). It is used to fix the Create Directory bug below. Some Qt-based applications failed to launch from fman. For instance, when you associated .png files with XnViewMP and opened such a file from fman, nothing happened. This is now fixed. Some heavy fman users reported that GoTo became slow over time. To prevent this, fman now limits the number of entries in its GoTo-database (a.k.a. Visited Paths.json) to 500. This should preserve the speed, while not sacrificing much of GoTo's accuracy. As mentioned below, the InstallPlugin command didn't work on the newly released Fedora 29. This is now fixed. Updated fman's Python version from 3.5 to 3.6. Fixed a bug where creating a new directory did not place the cursor on it. It for instance occurred when you created a folder in a subdirectory of /Volumes on MacOS. Updated the version of PyInstaller, the library which is used to compile fman's source code into a standalone executable, from 3.3 to 3.4. This is in preparation of an upcoming release, which will update the Python version of fman's plugin API from 3.5 to 3.6. Fedora 29 just came out. Previous releases of fman failed to start on it. 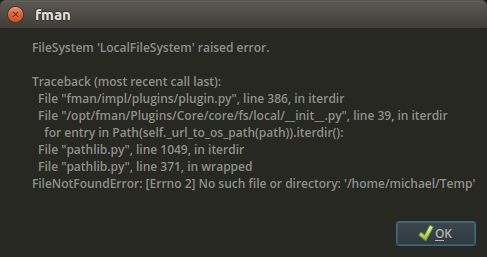 Now it works, with one exception: The built-in InstallPlugin command raises an error. This will be fixed in an upcoming release. fman is now available on CentOS! Please see today's blog post for details. 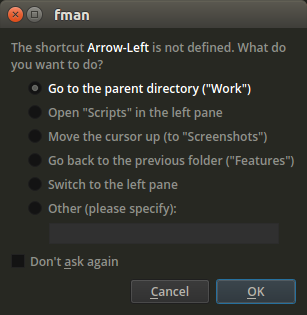 When you define a custom keyboard shortcut in fman, it does not overwrite any old shortcuts. For example: On Mac, Enter opens the current file. If you add Cmd+O as a shortcut for that action, then Enter still works. Added the missing description to fman's installer on the Arch User Repository. ... or via the standard shortcut Cmd+Ctrl+F on Mac. The previous release broke automatic updates on Ubuntu. This is now fixed. Fixed fman's broken Arch Linux package. fman is now available on Fedora Linux! Please see today's blog post for details. The screen reader will now read out "Downloads" instead of "Row 1". When you drag a file, the operating system displays either a "+" to indicate that it will be copied, or a different symbol to indicate that it will be moved. Which of the two operations is performed depends on the keys you press (if any) while dragging the file. On Linux, Control and Alt switch from the default behaviour of moving to copying. 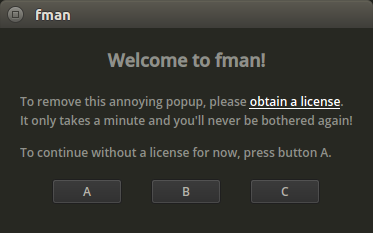 fman had the default behaviour wrong on Linux. (It copied by default and moved when you pressed Shift.) This is now corrected. In some cases, the Abort button had no effect (fman kept showing you the above dialog for further files.) This is now fixed. The shortcut F11 copies the paths of the currently selected files to the clipboard. This is useful, for instance when you want to paste these paths into a Terminal for further processing. At the suggestion of a user, fman now instead copies the path of the empty directory. Fixed a small but crucial bug in the Tutorial: It did not notice when you had successfully invoked GoTo. This meant that many new users have been unable to complete the tutorial. 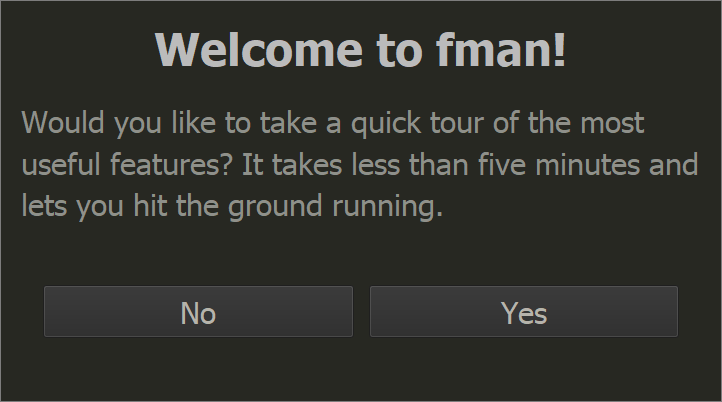 Made the first behind-the-scenes changes for an upcoming release of fman on Fedora Linux. This is now fixed (the filter bar disappears when there are no characters to be shown). When filtering was taking place, you could use the Arrow keys to move the (invisible) cursor. When you then pressed another character, it was inserted in the middle of the current filter, instead of at the end. This too is now fixed. A new command, GoToRootOfCurrentDrive on Windows now takes you to the root of the current drive. Its shortcut is Ctrl+\ (as in Total Commander). Decreased the size of the filter bar slightly, so it takes up less space. Improved the layout of the filter bar on high DPI Windows devices. fman's offline installer was broken on Windows 10. This is now fixed. When you pressed Escape when the filter bar was visible, it disappeared but the files were still being filtered. There was no visual indication that this was the case. Now, the filter bar is always visible when filtering takes place. To clear the current file filter, you had to press Escape twice: The first stroke hid the filter bar, the second actually cleared the filter. Now, a single stroke hides the bar and clears it at the same time. Files used to be filtered by a prefix match: When you had the files A.txt and Project A and you pressed A, only the first file remained. Now, both files remain. Filter files as you type. Display what is being typed while jumping to a file/directory. Make it possible to filter files by wildcards such as *.jpg. For more information and screenshots, please see the associated blog post. Explorer by default moves files, except when you press Shift. In that case, it copies them. fman had this the other way around, which clashed with a little symbol that's displayed when you drag the file. When you pressed Shift and dropped the file onto fman, it was actually moved to the Recycle Bin, not to the target directory. Obviously, fman itself does not "accidentally" delete your files when it is supposed to either move or copy them. This was caused by a bug in Qt. On every major OS, the clipboard has several "departments" (technically, MIME types). For instance, when you copy a picture, the "image data" department might contain the picture's pixels while the "file path" department might contain the image's file path. When you copied a file, fman used to overwrite two departments: the "file path" and the "plain text". This way, when you pasted in a text editor, the file path would appear. A user pointed out that the plain text part should not be overwritten when copying a file in fman. 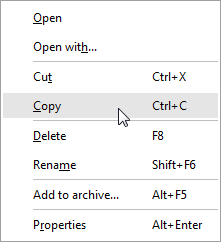 This makes it easier to copy/paste a file and then rename it to a (copied) part of another file's name. 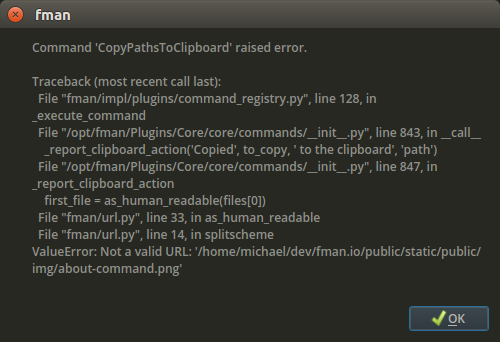 To accomodate this, fman now only overwrites the "file path" part of the clipboard when you copy a file. The "plain text" is left intact. fman did not show symbolic links pointing to non-existing targets. This is now fixed. On macOS, applications are technically directories with the extension .app. When you "open" them in Finder, it launches the app instead of showing its directory's contents. Fixed a bug that sometimes prevented you from opening shared network folders: Opening a subdirectory of the network share immediately redirected you back to the share itself. This happened for some users who had set the scale of "text, apps and other apps" in Windows 10's Display settings to a value other than 100%. 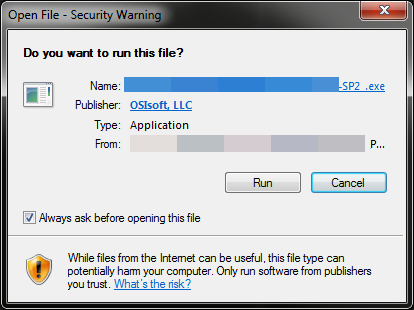 The "Yes to All" button in this dialog had the same effect as the Yes button, that is, it did not prevent the dialog from popping up for further errors. This is now fixed. Fixed a small (but crucial) bug that prevented users from completing the tutorial. Plugin 'Core' failed to load. RuntimeError: Font 'C:\Users\user\AppData\Local\fman\Versions\1.1.8\Plugins\Core\Open Sans.ttf' could not be loaded. This is now fixed. As a side effect, fman's installation size was decreased by a few hundred KB. The SwapPanels plugin lets you quickly swap the directories shown in fman's left and right panes. In recent fman versions, executing this functionality sometimes caused fman to freeze. This is now fixed. Fixed a few behind-the-scenes exceptions. When you buy fman, you can optionally choose to subscribe to updates. 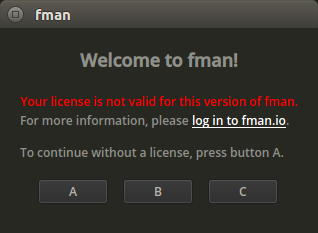 If you don't, then your license is only valid for the current version of fman. In some cases, clicking or selecting the second suggestion in GoTo had no effect. This was a bug that was introduced in version 1.1.9. 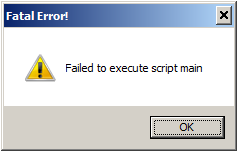 On Windows, when you open an executable (eg. .bat) in fman, the working directory is now first set to the folder containing it. This is required to run some scripts (/applications). fman now handles this case more gracefully and simply goes to the first existing parent directory. This lead to follow-up errors where eg. fman could not copy / move files. Improved the robustness of fman's built-in command for installing plugins. Fixed a problem with Cryptomator drives (on Windows). Fixed a behind-the-scenes bug with drag and drop. Fixed behind-the-scenes exception when you pressed F2 in an empty directory. Improved support for UNC paths in GoTo on Windows. GoTo is not yet able to auto-suggest all network drives. You can however type the full path \\server\folder to a network folder. Even though GoTo doesn't autocomplete it, when you press Enter it is still opened. When you then pressed Enter, GoTo opened other-server. Now, it opens server instead (if it exists). On Ubuntu with the neo2 keyboard layout, pressing AltGr triggered the first command defined in Key Bindings.json. This is now fixed. Fixed a behind-the-scenes exception when you pressed F2 in an empty directory. fman still failed to start on some Arch Linux users' systems. This too should now be fixed. Opening directories with a few thousands files is now 40% faster! There was a bug where fman did not remember the sort settings for a folder (eg. "Sort by Modified") when you set the sort order by clicking on the respective column header. This is now fixed. Improved the size of Quicksearch dialogs (eg. GoTo and the Command prompt) on Windows. When a Zip archive was deleted while you were browsing its contents, fman froze. This is now fixed. Improved performance for directories with several thousand files. When opening a symbolic link to a directory, fman used to display the link's destination in the navigation bar. The classical example of this is C:\Windows\System32: When you open it, fman used to display C:\Windows\SysWOW64 in the location bar instead. This is now fixed. Fixed another problem with opening files on Windows. 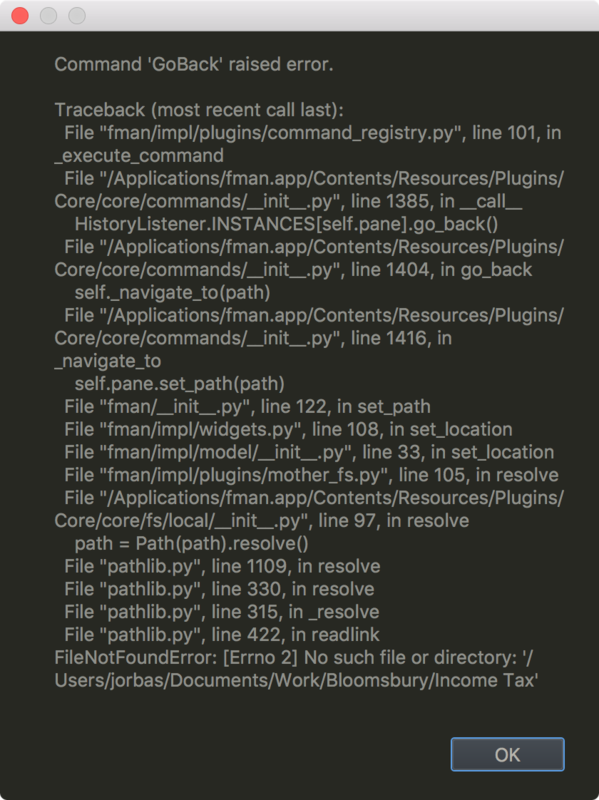 On Mac, when copying text in fman and pasting it into some other applications such as PyCharm, a few "invisible characters" were prepended to the text. This was caused by a bug in Qt. A workaround was implemented in fman to avoid this. 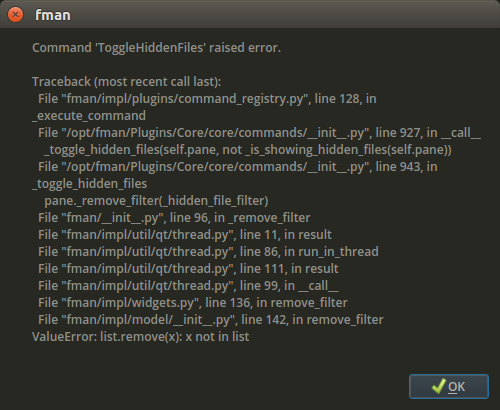 fman's built-in command for reloading plugins did not reload commands. This is now fixed. You can now preview multiple files with macOS's Quick Look feature by pressing Shift+Space. 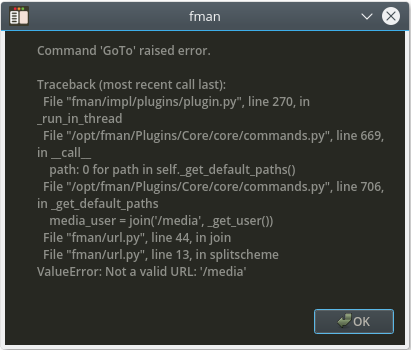 fman's Arch Linux distribution failed to start with error No module named 'PyQt5.sip'. This is now fixed. Then, assuming "Gimp" is defined in Apps.json in the same directory, you can open the currently selected files in Gimp with Ctrl+Enter. Please see the associated blog post for details. This was requested by users to make it easier to see where you can drag them. Also, it makes it somewhat clearer which column the triangular sort indicator belongs to. Fixed error SSL: CERTIFICATE_VERIFY_FAILED in fman's InstallPlugin command for some users on macOS. Several API changes. For more details, please see this post. On Mac, the default shortcut for opening the current folder in the other pane used to be Ctrl+Left/Right. This had no effect because the same shortcut is used by macOS to switch spaces (=desktops). The default shortcut in fman was now changed to Alt+Left/Right. Thank you to fman user Matan Gover for suggesting this. On Windows, copying a file to the root of a removable or virtual produced an error access is denied. This too is now fixed. Depending on the clipboard contents, fman's Command Palette failed to open for some users on Windows 10. This is now fixed. Fixed a few other small behind-the-scenes exceptions. 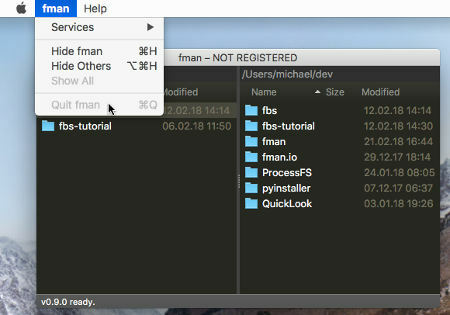 macOS's Quick Look feature for previewing files was previously only available in fman through a plugin. It is now a part of core fman. Improved the layout of fman's GUI elements on high DPI displays on Windows. 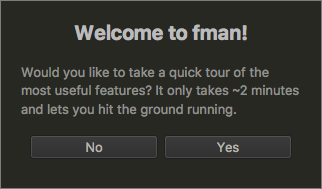 Slightly improved fman's onboarding for new users. It's now possible to select files by mouse: Hold Shift to select a range of items, or Ctrl/Cmd to toggle individual files. Fixed an old error message when opening virtual drives on Windows. fman now has a context menu! Please see this blog post for details. fman remembers the sort order of your directories: For instance, many people like to sort their Downloads folder by the Modified date. When you leave the folder and open it again, it will automatically be sorted by the Modified column. This feature (of remembering the sort order) did not work when you were viewing the contents of a Zip archive and went up to the folder containing the archive: The folder was always sorted by Name instead of eg. the Modified column. This was a bug and is now fixed. 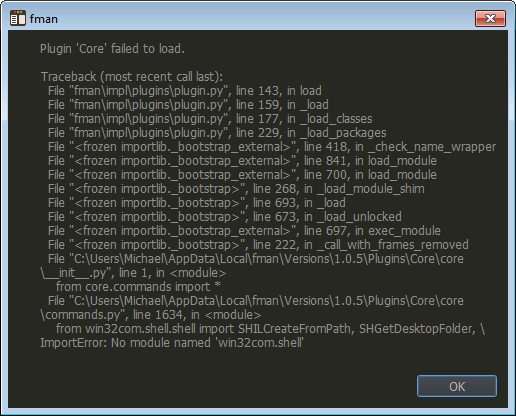 Some Windows users were still seeing errors that the Core plugin failed to load (see version 1.0.6 below). This is now fixed, though they may still see an error when invoking the ShowExplorerProperties command. Further research is necessary. fman internally uses 7-Zip to pack and unpack archives (.zip, .7z, ...). 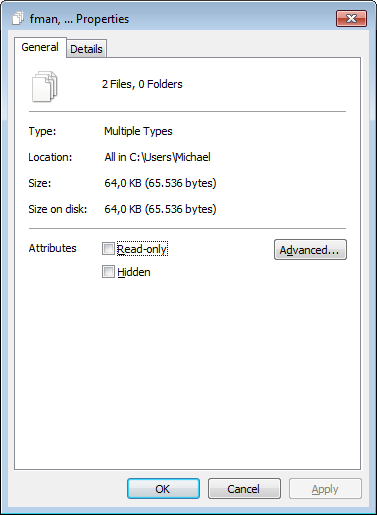 Last week, a security vulnerability was found in 7-Zip. fman's version of 7-Zip was updated on Windows to fix the issue. On Linux and Mac, an official fix by the 7-Zip developers is still pending and will be incorporated into fman as soon as it is out. Fixed several small behind-the-scenes exceptions. fman lets you customize your keyboard shortcuts via a settings file. 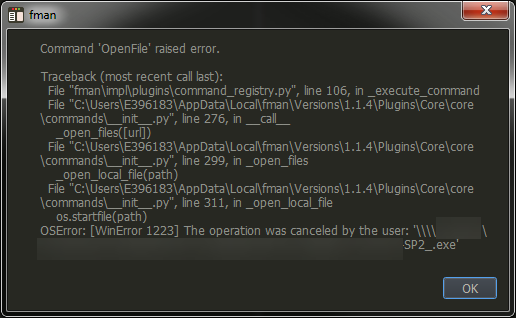 It now gives more informative error messages when there is a mistake in the file. This had already been possible via a user-contributed plugin. However, the plugin could only show the properties of a single file. The new implementation supports multiple files as well as drives and network locations. When this happens, fman now displays your home directory instead. fman now supports the Numpad keys Delete and Insert for deleting/selecting files. The usability of these dialogs was improved and a few more missing shortcuts were added. There was a bug where fman froze when you uninstalled a plugin while being inside the plugin's installation folder. This is now fixed. A user kindly pointed out that fman's way of launching the Terminal on Windows when you press F9 posed a security risk. This is now fixed. This is now fixed by fman simply going to the first still-existing parent directory. Fixed a few small behind-the-scenes exceptions. fman remembers the sort order of your directories. For example, if you sort your Downloads folder by the Modified column and then visit it again, that sort order is preserved. There was a bug however, where the sort indicator was drawn on the Name column even though the files were sorted differently. This is now fixed. A user did not know that Backspace goes up a directory. He used Cmd/Alt+Left instead to go back in history. This did not select the directory you just came from: When you went "back" from C:\Windows to C:\, your Windows folder was not selected. Now it is. Managed to make displaying folders with several thousand files a few more hundred milliseconds faster. Improved the error reporting for custom file system implementations, so plugin developers can more easily figure out what's going on. A few small stability improvements. fman now has an Open With command! This has been the fifth most-requested feature for a while. For more details, please see today's blog post. On Windows, fman had trouble opening files with spaces in their name. This is now fixed. On some users' systems, fman did not display the contents of Zip files whose members contained Unicode characters in their file names. This too is now fixed. It is now possible to click on the suggestions in this dialog with the mouse. Several users saw error messages mentioning the Name column. This is now fixed. 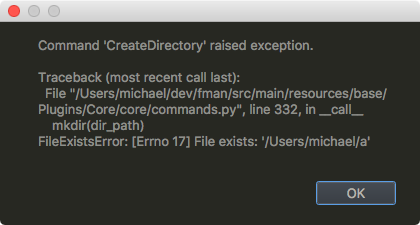 Creating a file with a % sign in the name produced an error. This too is now fixed. Also this is now fixed. fman now opens folders ten times faster than version 0.9.8! Like many other improvements, this was suggested by a user. fman features a plugin system that (among other things) lets you implement custom file systems such as Dropbox. Some file systems such as the FlatView plugin actually display local files. In previous versions, it was not possible to open these files while within the custom file system. Now, it is possible. This will be useful for instance when a search:// file system is implemented where you can then simply open files from the respective search result. Added new API function resolve(...) to implement the previous point. Fixed a bug affecting the Move command in conjunction with folders. 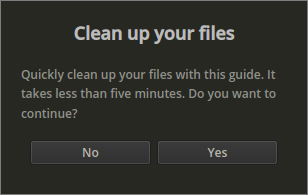 On Ubuntu, deleted files did appear in the Trash, but could not be "restored" in the usual way. (You had to manually move them from the Trash to their previous location.) This bug is now fixed. 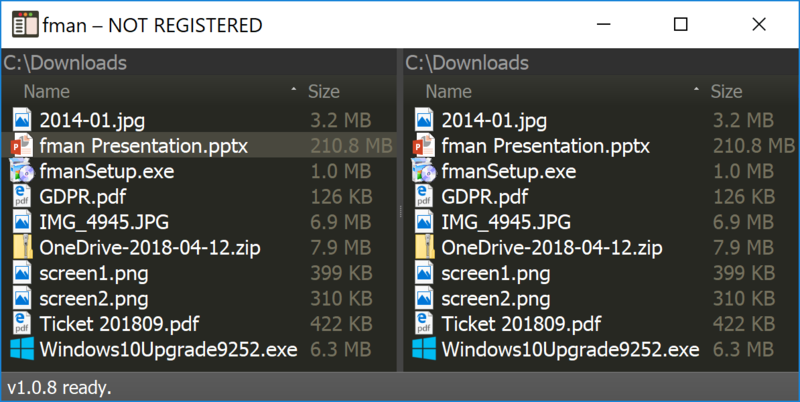 fman sometimes didn't "see" all files in certain Zip files. This too is now fixed. Improved support for the MoveToTrash command on elementaryOS. In particular, you can now delete contents of your Keybase folder. fman's API has a method set_sort_column(...) that lets you change the sort order. This function takes a parameter for identifying which column you want to sort by. This used to be a number; For example, set_sort_column(2) would sort by the third column. The parameter was changed to now be the name of the column: set_sort_column('core.Modified'). The function get_sort_column() was updated accordingly. Several changes in preparation for significant performance improvements in fman 1.0.0.
fman now supports network shares on Windows! When the directory you are in was deleted, fman went to null:// instead of the first existing parent directory. This is now fixed. fman didn't show the tutorial on first start. This too is now fixed. 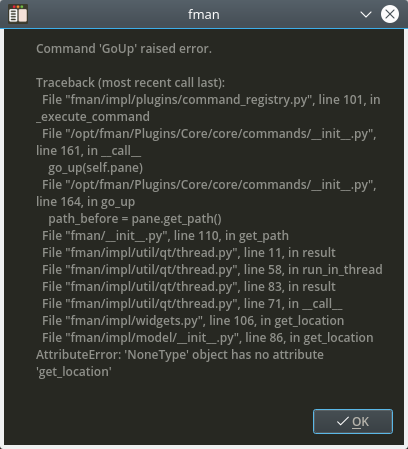 When the user clicks the location bar, fman gives a hint that (s)he should use Ctrl/Cmd+P instead to launch the GoTo dialog. Improved the wording in this hint. fman failed to display some file names with Unicode characters in Zip/7-Zip/Tar archives. This is now fixed. fman sometimes didn't display some directories in archives. This too is now fixed. The MoveToTrash command on Windows had no effect. This is now fixed. Some Mac users on early macOS versions were still experiencing crashes. This should now finally be fixed. Please see today's blog post for details. Fixed an error affecting the MoveToTrash command for some Windows users. The previous version 0.9.1 failed to start on some Mac users' systems. This is now fixed. 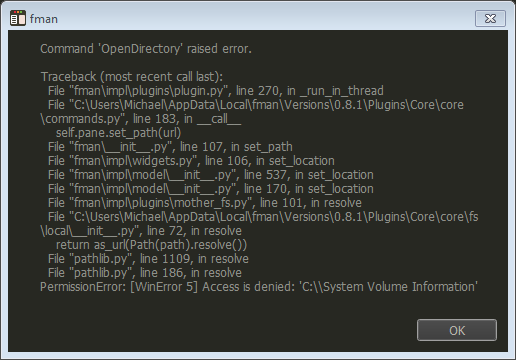 Unfortunately, the only solution was to downgrade fman's Python version to 3.5 again. fman now supports the very ubiquitous shortcut Alt/Cmd+↑ for going to the parent directory. Improved fman's command for opening files (ie. what happens when you press Enter) to support Cryptomator vaults / drives on Windows. What was even worse that in this case (you clicked on the menu while a dialog was open), the shortcut Cmd+Q for fman no longer worked. The problem is likely caused by a bug in the Qt framework, which fman uses to display its GUI. As a first step towards fixing it, some logic was added so that at least the shortcut Cmd+Q works again. This is fixed so fman now again moves the file. The InstallPlugin command did not work on some users' macOS systems. (It gave an error TLSV1_ALERT_PROTOCOL_VERSION.) This is now fixed. 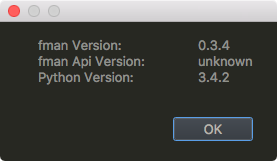 fman's Python version was updated from 3.5 to 3.6. This in particular fixes the previous bug, and the next one below. But, as an unfortunate consequence, previous versions of the ProcessFS stop working with ImportError: cannot import name '_psutil_osx'. If you have this plugin installed, please re-install it. fman now supports BoxCryptor virtual drives. It had previously raised a FileNotFoundError when you tried to navigate to them. This has been one of fman's oldest requested features. It's great it's now implemented. The Quit command froze fman on Windows. This is now fixed. When you purchase a license, you receive a license key file. fman now more gracefully handles the case when this file gets corrupted somehow. fman's built-in command for reloading plugins has been broken since last week's release. This is now fixed. fman's new file system API is out! See today's blog post for an example. The API function DirectoryPane.get_columns() now uses fully qualified names core.Name instead of just Name. Improved the signature of the get_tab_completion parameter in the show_quicksearch(...) API function. On Windows, opening a .bat file with fman did not run the file in the correct directory. (To be precise, it was run in the context of fman's installation directory instead of its containing directory.) This is now fixed so running .bat files should work as expected again. On Linux, xdg-open is the default tool for opening files and directories with the respectively associated application. In particular, passing a folder to xdg-open opens it in your configured native file manager. 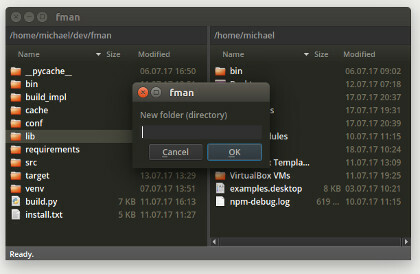 A user complained that fman fails to open the native file manager on Ubuntu MATE. fman now calls upon xdg-open to fix this problem. Similarly to the previous point, fman now also respects more Linux distribution's settings for the default Terminal app. 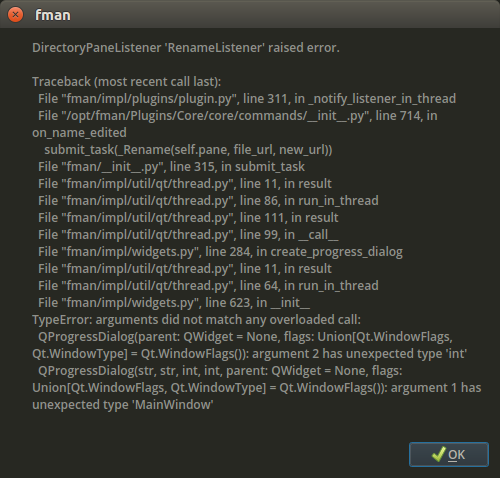 Also on Linux, fman failed to launch Qt-based applications such as VLC. So for instance when you pressed Enter on a movie, the VLC icon would appear but the movie would never be played. This too is now fixed. Several improvements to the (as yet unpublished) new file system API. Using it, it's already possible to write a plugin for managing the programs running on your computer. Or a (very basic) SFTP plugin. 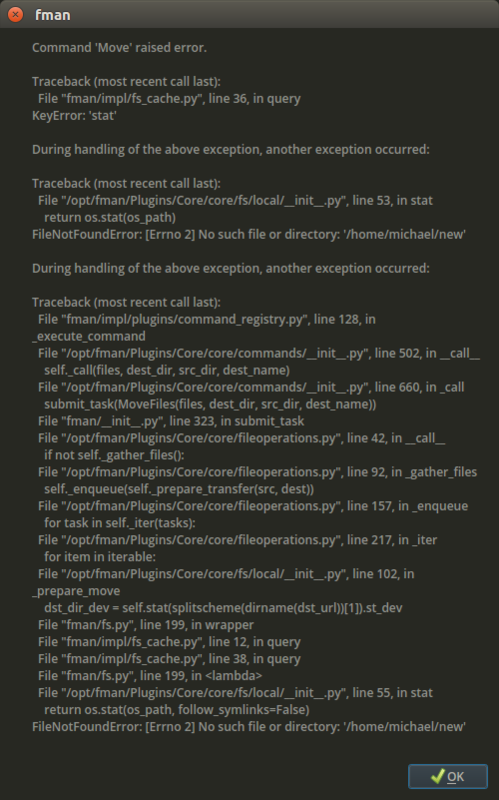 What's great is how little code is required to write such plugins (~100 and 75 lines, respectively). Fixed a few small behind-the-scenes exceptions, for instance to do with the sorting of files. Drag and drop was broken since version 0.8.3 from two days ago. This is now fixed. Made several small improvements to the built-in tutorial. Several other small behind-the-scenes bug fixes and stability improvements. Unfortunately, the update mechanism on Mac was broken in fman 0.8.2 and 0.8.3. This release fixes the problem. If you are on one of the two affected versions, please download and re-install fman. Sorry for the inconvenience. 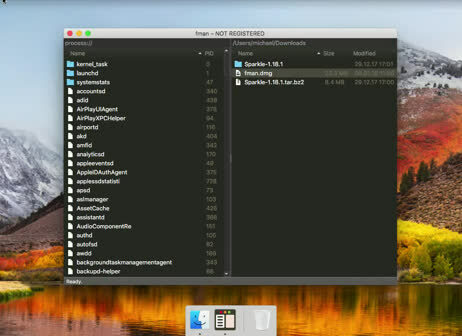 fman now remembers the sort settings for each folder you visit. This has been among the top 10 most-requested features for a while! Great it's finally here. The shortcut for the new SortByColumn command on Mac is Cmd+F1. The reason for this is that fman's shortcuts on Mac try to mimic those on other OSs by replacing Ctrl by Cmd. So, because the shortcut for sorting by for example the first column is Ctrl+F1 on Windows on Linux, it should be Cmd+F1 on Mac. However, Cmd+F1 used to be bound to opening your /Volumes folder. Because of this conflict, the /Volumes shortcut was changed to Alt+F1 (which is also the same on Windows and Linux). If you don't like this default, please see here to change it. The Command Palette now remembers which command you last entered and automatically selects it the next time. This is very useful when you have to run the same command several times in a row (such as for instance when reloading plugins via ReloadPlugins). Now, fman loads both directories in parallel. In the video below, the right side is loaded so quickly that it is immediately visible. Made a small performance improvement for listing the contents of directories. This required changing the API of fman.fs.is_dir(...) slightly: Previously, it returned False when a directory doesn't exist. Now, it raises a FileNotFoundError. Made several changes in preparation for an upcoming API that lets you implement your own file systems. A user asked to be able to switch panes not with Tab but with the Arrow keys. A plugin was written to allow this. Another licensed user complained that fman kept crashing on Mac. The crash occurred in the Sparkle framework, which fman uses to update itself. The library was updated to the latest version. Hopefully this will fix the problem. The new build process resulted in a failed release. This is now fixed. fman now reloads the current directories every time its window (re-)gains focus. This keeps them even more up-to-date, for example when you create a file with Shift+F4 and write some contents into it. Work has begun on open sourcing fman's build process. This is the first release that uses the new open source library. As a result, it updates fman's (Py)Qt version from 5.6.2 to 5.9.2. Added support for .tar and .7z archives! Hugely improved the performance of all archive-related features. fman now treats .zipx, .jar, .xpi files as Zip archives. fman previously didn't recognise archives with an upper-case extension (eg. .ZIP instead of .zip). This works now. The API was expanded so your plugins can do the same. Here too, the existing API was expanded so your plugins can do this as well. Fixed a few further small behind-the-scenes exceptions. The built-in InstallPlugin command for installing plugins was broken for first-time users. This is now fixed. Fixed a small behind-the-scenes exception. The Zip functionality on Mac did not work because of a wrong binary file. Hopefully it should work now. The last version introduced a regression on Mac where opening fman again when it was already running would not bring its (existing) window to the foreground. This is now fixed again. This implementation artifact now no longer appears. A few tiny and non-breaking improvements to the API. Since release 0.7.0, fman failed to start on Ubuntu versions < 16.04. This is now fixed. 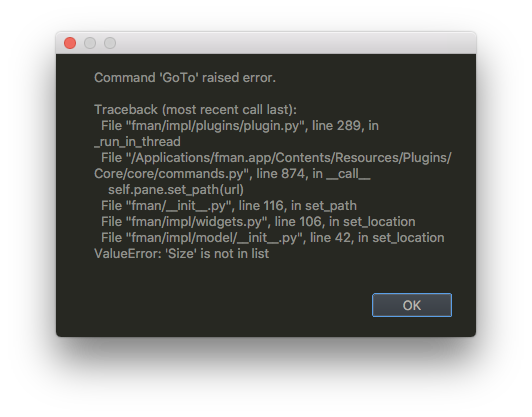 Some Mac users were unable to use fman's new Zip functionality (Zip files appeared empty, Packing files resulted in an error). This should now hopefully be fixed. When going up to the parent directory, the cursor briefly appeared on the first folder in the parent dir before being placed at the (child) directory you came from. This unnecessary flickering effect is now avoided. fman's InstallPlugin command for installing plugins did not properly extract executable files in the respective plugin. (It failed to set the executable bit on Mac and Linux, which lead to the plugin not being able to run its own executables). This is now fixed. fman sometimes didn't notice when a directory's contents were changed (eg. by the MoveToDir plugin). It now reloads directories every time you enter them to work around this. Several small behind-the-scenes exceptions were fixed. 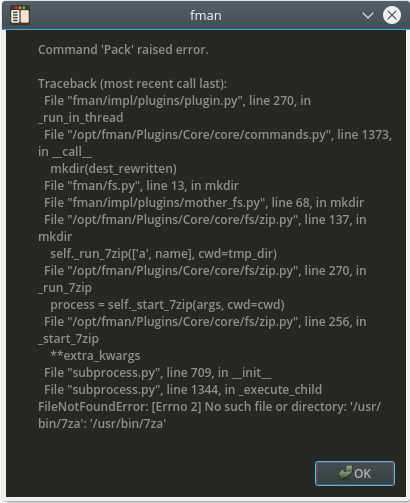 On some Linux systems, the new Pack command failed with an error invalid cross-device link. The problem was very well-explained and pinpointed by a user on fman's issue tracker. This bug is now fixed. Several users complained that fman sometimes corrupted Visited Paths.json, the file which stores the folders you visit most often for the GoTo command. It is likely that this was a concurrency issue and should now hopefully be fixed. Sometimes you got an error when using the new Reload command to refresh the current pane. This, too shold now be fixed. It's now possible to drag a file from inside a Zip file to a normal folder inside fman. Previously, "nothing" happened. You had to use the keyboard (with the Copy command F5). Added a Reload command for refreshing the current directory. You can invoke it with Ctrl+R on Windows and Linux, and Cmd+R on Mac. fman normally notices external changes to files (eg. when a file is created outside of fman) and updates its UI accordingly. This did not work properly for file attributes. It should now be better. fman was unable to zip files on non-NTFS drives on Windows. This is now fixed. The plugin was updated to fix this. The usual operations of copying, moving, deleting files are fully supported. fman's columns now automatically resize when you enter a directory or resize fman's window. This was requested by several users on fman's issue tracker. When you execute the Show drives (Alt+F1) command on Windows, you are now taken to a new drives:// file system that lists your drives. fman now prevents you from copying/moving a file to itself. On Mac, there was a bug where renaming a file briefly displayed two files (one with the old name, one with the new). This is now fixed. 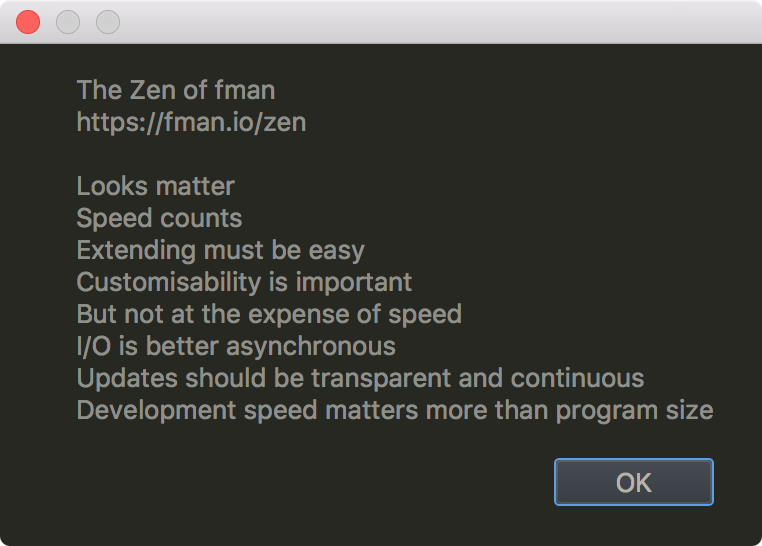 The Zen command was updated to reflect fman's new Zen. The Remove Plugin command which lets you uninstall plugins can now also remove plugins that could not be loaded. This is important because the new version of fman introduces some breaking API changes and you might want to uninstall the broken plugins. Many other small improvements. In all, 318 commits were made to fman's source code since the last release. A licensed user complained that when the file name column is too narrow, there is no way to see the entire file name. Previously, starting the tutorial multiple times in the same fman session lead to errors and unexpected behaviour. This is now fixed. A few other small bug fixes and behind-the-scenes improvements. This wasn't very helpful and it lead to some exceptions behind the scenes. 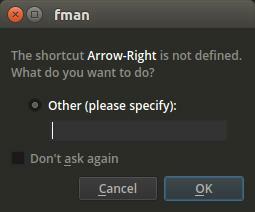 When there are no options to present, fman now simply does not show the dialog. The tutorial asks the user to pick an example directory at the start. The directory is then used throughout the tutorial. On Windows, fman did not properly handle the case where the folder was on a different drive. This is now fixed. Several small improvements / bug fixes for the tutorial. Made the tutorial easier to follow. This was implemented for a licensed user. He prefers to move the splitter all the way to one side to effectively use fman in "single-pane" mode. fman's tutorial was significantly expanded to better onboard new users. 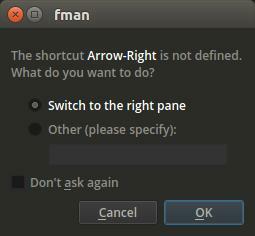 Fixed a small bug where when starting fman, always the right pane (instead of the left pane) had focus. It was necessary for the new tutorial. fman's command for installing plugins only displayed 30 plugins. As of last week, there are 31 plugins available for fman. Fixed the command so it displays all plugins. Fixed a bug affecting the DeletePermanently command on Windows. On Windows, when you used GoTo to manually navigate to a drive letter such as D: without a trailing backslash, fman ended up in an inconsistent state where subsequent copy operations to that drive failed. Fixed this. 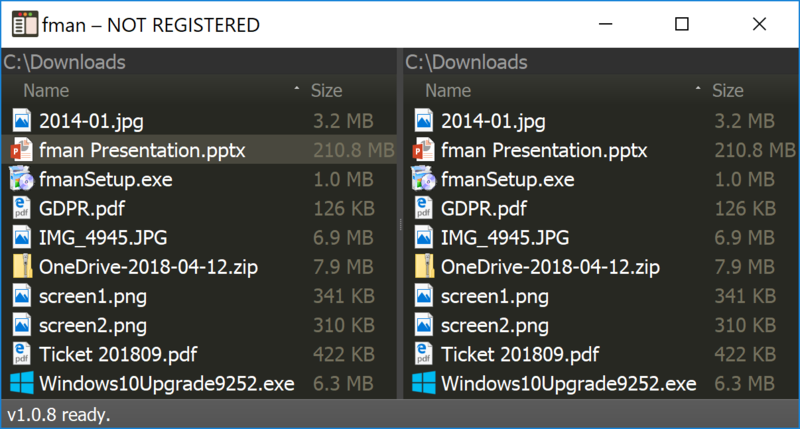 fman's command line now lets you pass files in addition to directories. When you supply a file, fman opens its containing directory and places the cursor at the file. Please note that the feature was only implemented for macOS because fman doesn't have a menu on the other OSs. On Windows, when you were at C:\ and pressed Backspace (the default shortcut for going up a directory), the cursor disappeared. This bug is now fixed. When you started to rename a file with Shift+F6, but then pressed Enter without having changed the name, the file was opened. This bug is now fixed as well. A significant number of users didn't read the message. They were then surprised that the plugin didn't work. This is now fixed and fman starts again. 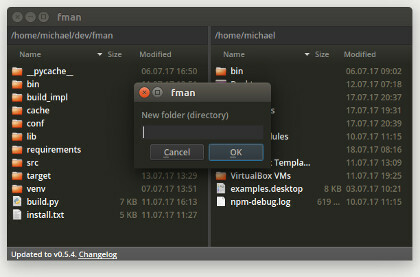 Create folder in the above screenshot is another example: Previously, it was only possible to find it under Create directory. Now you can search for New folder, Create folder, New directory or Create directory. Several users got stuck at steps 2 and 4 of the tutorial. The wording was improved to hopefully prevent this. Small bug fix for Arch Linux. fman's Arch Linux package was broken. The new release fixes this. The shortcut for this command is Shift+Delete. The main advantage of this way of deleting files is that it is much quicker. GoTo on Steroids now lets you paste in a file path. When you do, fman jumps to the containing directory and places the cursor at the file. F11, which copies the path of the selected file(s) to the clipboard, used to use / as the path separator on Windows: C:/a/b. It now uses the more appropriate backslash: C:\a\b. This makes the copied paths better suited for pasting into the Windows command prompt. Improved the layout on High DPI displays. 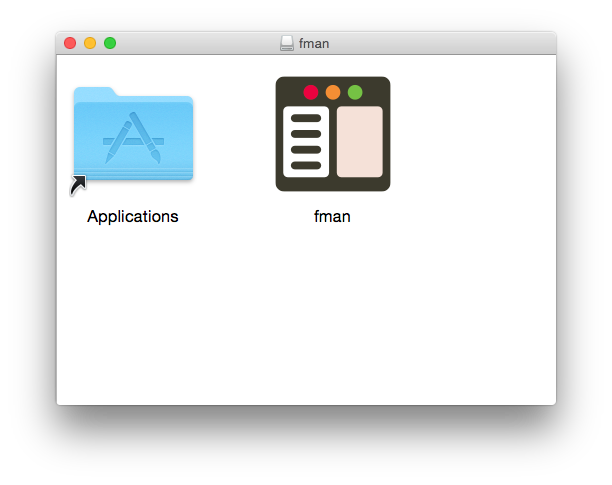 On Mac and Linux, fman now closes when you its invoke its executable from the command line and press Ctrl+C. This is in line with what Linux (and Mac users, to some extent) expect from an application. Fixed a few small bugs affecting the tutorial introduced in v0.5.0. Fixed a few small bugs affecting GoTo on Steroids. Fix for a small bug affecting GoTo on Windows. You can also start the tutorial at a later time by typing Tutorial into the Command Palette. GoTo on Steroids only used to display folders you had already visited. This means that it wasn't very useful when you used fman for the first time. It is now much better at also recommending directories you have not visited before. 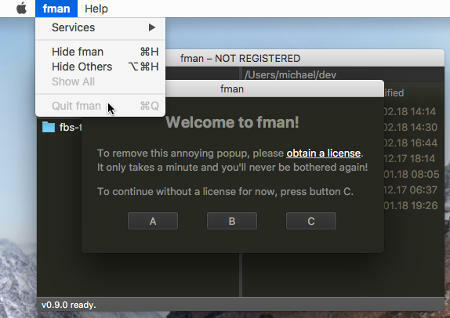 On Mac, it was not possible to close fman while one of the Quicksearch dialogs (GoTo / Command Palette) was open. It's now at least possible via ⌘Q. fman on Mac now starts one second faster! For the background story, please see the associated post. On macOS, fman sometimes crashed while starting. This was caused by a slightly non-conformant configuration of the Sparkle framework, which fman uses to update itself. The problem is now fixed. On macOS, launching an app when it's already open puts it in the foreground. This didn't work for fman because of a bug in one of the libraries it uses. A fix for the bug was contributed to the library to make fman work as expected. This was the fourth-most requested improvement on fman's issue tracker, including by licensed users. It's great that it has finally been fixed. The reason was an internal file that had somehow become corrupted. fman now handles this case more gracefully (and starts successfully). fman now realises that both paths actually refer to the same directory, and no longer displays the duplicate entry. Some Arch Linux users didn't like that automatic updates for fman were enabled by default. Automatic updates on Arch are now disabled by default. If you'd like to enable them, please follow the instructions here. fman now supports Arch Linux! For details, please see this post. Pressing the Home/End key on macOS while the GoTo dialog was open had an unintended effect: Instead of moving the cursor to the beginning or end of the text input field, the first or last item in the list of suggestions was selected. This is now fixed so that Home and End change the cursor position as on Linux and Windows. fman's GoTo dialogs had a noticeable delay of about 250ms every time you pressed a key. The rendering engine was rewritten to bring this down to 2ms. This 100x speed improvement makes GoTo much snappier. The documentation mentioned in the prompt is here. Fixed a small bug where fman forgot the cursor position (ie. the "selected" file) when showing dialogs. Numpad Enter now behaves in the same way as "normal" Enter. Previously, pressing numpad Enter simply had no effect. This copies the text Hello World! to the clipboard. Since the last release, commands are run in separate threads. This broke clipboard-related commands on Windows. They now work again. It's now possible to manage plugins inside fman! Please see this post. fman failed to start on Linux distributions not based on Gnome. This is now fixed. macOS doesn't support "cutting" files. That is: It's not technically possible to place files on the clipboard in such a way that apps like Finder understand that the files are meant to be moved and not copied when the users pastes. It's why you have to press ⌘-⌥-V to move files in Finder. Plugins are now run in separate threads to keep fman more responsive. Added ApplicationCommand to fman's API. A blog post explains why. fman failed to launch on Ubuntu 16.10. This is now fixed. 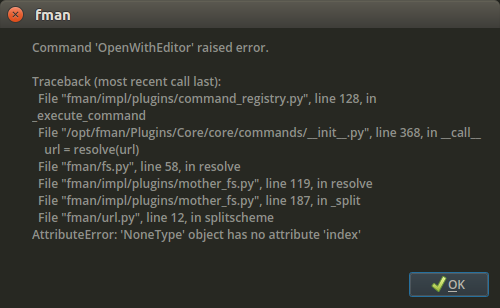 Choosing the F4 editor on Linux raised an error. Fixed. fman failed to start on some users' macOS 10.10. Fixed. This was one of fman's oldest and most difficult bugs. The cause turned out to be a missing DLL (api-ms-win-crt-multibyte-l1-1-0.dll). Finally, the bug should be fixed! On Mac, fman sometimes crashed while closing. This was caused by a bug in the Qt framework. fman's Qt version was updated to fix the issue. There is now a Deselect command for clearing the selection. You can invoke it with Ctrl + D (Cmd + D on Mac). fman's Python version was updated to 3.5. 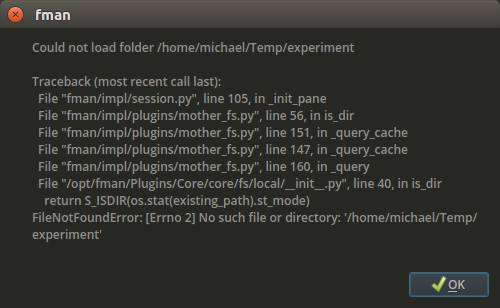 This fixes a potential Python bug and lets plugins use the latest language features. The command for deleting files used to ask "Do you want to move ... to the recycle bin?" One user found this alienating because the recycle bin is called "Trash" on Mac. The dialog now uses the appropriate term for each OS. You can now go back and forth in your history of visited folders using Cmd/Alt + Left/Right. It has been possible for a while to show/hide hidden files via Ctrl/Cmd + .. Now, fman also remembers this setting across restarts. The Changelog link links to the present page. You can run it from the Command Palette as usual. In fman's API, the class DirectoryPane had a property .id. It was unnecessary, so it was removed. This breaks the plugin StatusBarExtended. A PR was created with a fix (and already merged by the plugin author). It's now possible to configure the font size and family. Please see this page for details. When asking whether to overwrite a file, fman prompted "do you want to override the file?". This English language mistake was kindly pointed out by a user and is now fixed. On Linux, opening executable files with Enter had no effect. Fixed this. The reason was that fman passed its own value of environment variable LD_LIBRARY_PATH on to child processes (in this instance the terminal). It no longer does this. Also, libtinfo.so.5 was removed from fman because most Linux distributions have it anyways and this reduces potential incompatibilities. This was because fman thought you were about to merge two folders. 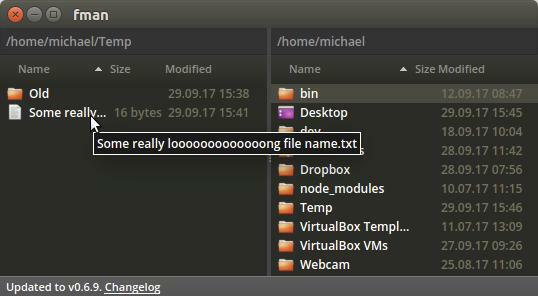 It now understands that this isn't the case and simply renames the folder without asking first. You can now disable automatic updates. More information here. Previously, fman license keys had to be installed by manually copying them to a certain directory. The email in the title bar (and the disappearance of the nag screen when you start fman) were the only indications that the license key installation was successful. There was a bug on Linux: Pressing Ctrl+Q to close fman didn't save the directories your were in for the next session. This is now fixed. fman on Linux used to include the file libreadline.so.6. In some cases, fman's version of this file was not compatible with other libraries on the user's system. 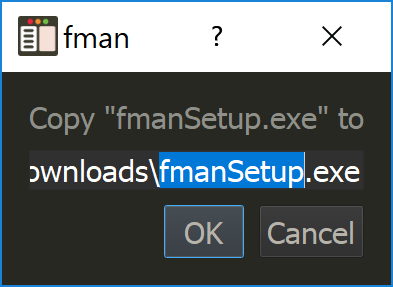 The fix was to simply not ship the file with fman. This way, the user's own copy of the file gets used, which is guaranteed to be compatible with the user's other libraries. The first time you press F4 to edit a file, fman prompts you to select the application to use as an editor. 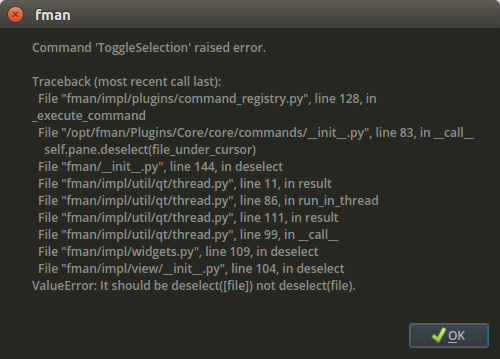 fman didn't properly handle the case where you cancel that dialog, resulting in an error the next time you tried to edit a file. This is now fixed. On Linux, fman used to install an auto-update cron job that checks for new versions once a day. Linux users do want to be able to update, but criticised that fman forced the schedule of "once a day" upon them. fman now lets Linux users choose the update interval. For more information, see this post.